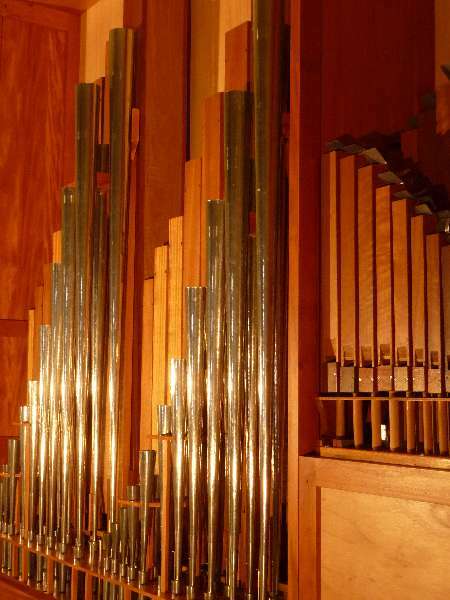 The pipe organ at Clackline Valley Olives was built by Western Australian organ builder Paul Hufner in 1963. The organ was bought to Clackline on Friday 14th January 2011 for restoration and installation. The organ was finally recommissioned on 18th November 2013. Case description Polished wood and metal display pipes - all pipes visible. Date of completion/installation Built 1963, installed this location 2013. Construction materials Mahogany timberwork for pipes, veneered timbers for console. New casework of plain veneered timbers. New pipes of 55% burnished tin. Key material Solid wood keys with celuloid facings. Number of pedals No pedals - autobass system for lowest notes originally, now autobass disconnected and full pedalboard installed for newly created "pedal" division. Placement Remote, but originally attached to organ case by mechanical linkage to Swell. Now connected to organ by cable. Divisions One division, originally under expression. Rebuilt as a Great division and Pedal division. Total number of pipes 92 pipes originally, now 163 pipes. Dates when key work has been undertaken on current organ Organ electrics overhauled, pipework cleaned, pipes repolished, manual chest overhauled and repolished, new pedal chest, new pedal pipework, new trumpet (horn) rank, new casework constructed, keyset changed to allow for additional compass of the organ, new pedalboard made and incorporated into existing console, console woodwork refurbished, new blower, new regulator, and organ installed at Clackline by Pipe Organs of Western Australia, 2013. Relocated to Clackline by Bruce Duncan for rebuild and installation 2011. 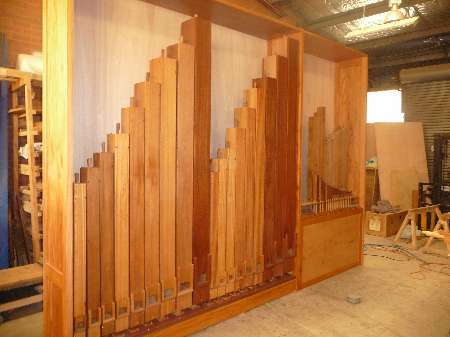 Rebuilt Pipe Organs of Western Australia, 2013. The initial assembling of pipework. 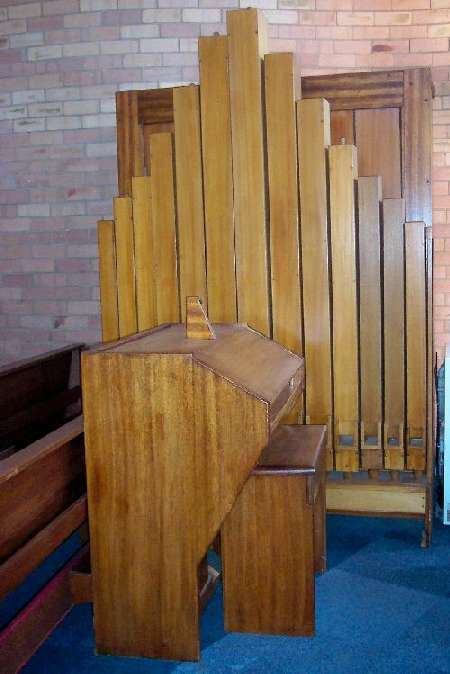 Note that most of the organ remains in pieces at the back. The nameplate of the builder, Paul Hufner, 1918-2010. 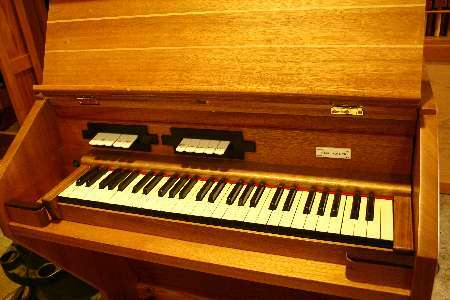 This organ is his Opus 18. He built about 30 new pipe organs and repaired/rebuilt many others in his lifetime.